The San Antonio & Aransas Pass Railway was incorporated in 1884. As president of the railway, Uriah Lott had his eye on a northwest expansion, Captain Charles Schreiner and others made sure that Kerrville (with a population of approximately 300) was chosen over Fredericksburg. At 11:45, October 6th, 1887, the first iron horse arrived with over 500 passengers on board. A seven gun salute, Mexican band and barbecue started up as the whole town celebrated. Kerrville was the last stop on the SA&AP Railway with a turntable built to manually turn the trains. The original depot was a wooden structure. Frank J. Beitel owned lumberyards in San Antonio and came to buy land along the tracks which ran down North Street. He established his lumberyard at 425 Clay Street in 1889. Most of the original passenger depot burned down in 1913. Mr. Beitel sold a piece of his land to the SA&AP where, in 1915, a new masonry depot was built. 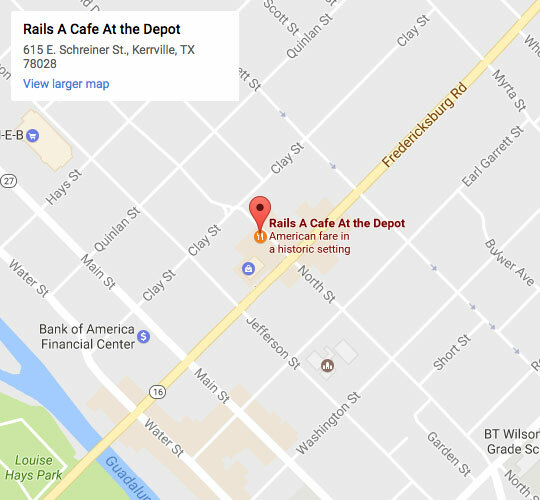 It is now home to Rails… a Café at the Depot. He also received, on his land, a spur of the narrow gauge rail tracks long enough for three cars to load and unload materials. Beitel built two long buildings for retail space and lumber bins lining the spur tracks. It operated as a Lumberyard for 104 years and is now home to Rails Events and Catering Hall. In 2017 both the Beitel Lumberyard and the SA&AP Passenger Depot received Registered Texas Historical Landmark (RTHL) designations and markers.